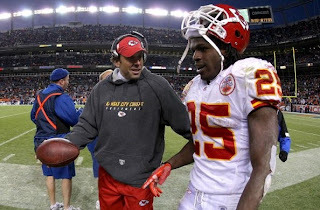 The Chiefs had a very successful 2010 draft, putting the organization in a strong position to contend for the next several years. Many of Kansas City's picks ended up contributing to the team right away; Eric Berry lived up to his high draft status, Tony Moeaki was productive at tight end and Dexter McCluster added some explosiveness to the return game. Dwayne Bowe finally broke out last season and put up Pro Bowl numbers. However, it is crucial that Kansas City find another big time wideout to open up the offense and take some pressure of Bowe. Some of the top wideouts in the draft like Julio Jones will likely be gone by the time Kansas City is up, and drafting a WR in the first round is always a risk. Kansas City may elect to grab a WR through free agency or a trade, and grab a wideout in the later rounds it can develop. Tamba Hali is as good as they come, but the Chiefs could use another playmaker outside in the team's 3-4 defense. There seems to be a lot of options here in the draft, and I wouldn't be surprised if this is where the Chiefs go in the first round. An outside linebacker likely provides Kansas City an opportunity to get the most bang for its buck in round one. A good nose tackle is essential for a 3-4 defense, and the Chiefs could use a playmaker at this position. I would be surprised if Kansas City didn't take a nose tackle at some point in the draft. While the Chiefs have done addressing this area recently, there is still room to improve. The line got beat soundly towards the end of the last season, and giving Matt Cassel more time must be a priority. In the past, teams have found steals in the later rounds with offensive lineman, and the Chiefs may be able to do the same this year. At the very least, this is an area that Kansas City could use more depth.